I’ve just played with it for 10 minutes, so I might be missing a lot of things, but this seems to be a very useful tool for anyone testing and reporting GNOME bugs. It’s extremely easy to set up, you just download a VM disk image and import it into virt-manager. Later you can update it from inside the system. Try it! In this blogpost I’ll describe how to run graphical applications under a different user account in your current desktop session (i.e. without fast user switching). It involves some fiddling with the system configuration, this is not intended for general users without advanced system knowledge. The instructions are created for Fedora 18. Everything mentioned here was discovered through a trial-and-error approach, I don’t have any expertise in this area. Some of the advice might not be fully correct. I have talked to a few qualified people and I was told that Linux doesn’t support this properly and some applications might display some glitches or not work at all. Consider this a best-effort solution – it might work perfectly for some applications, but you can’t expect it to work in general. Playing games. I use GNOME Fallback mode, so I get slightly better framerates (I have a very slow graphic card and it really makes a difference). Running unknown and “not so trustworthy” tools and scripts, often downloaded somewhere from the Internet (i.e. not packaged in Fedora). I do not really expect malware in these tools, but more likely serious bugs. I like to know that the unknown script can’t delete my personal data by accident. If you need to transfer a piece of text (e.g. a hyperlink) from one account to the other, it involves saving it as a file, copying it and fixing permissions. Ugh. If you are inside gamer session, you don’t see any notifications from your kparal‘s IM clients, mail clients, etc. You need to switch forth and back all the time to check your messages and reply. If you are inside gamer session, you can’t easily access some files in your kparal home folder that you would like to, e.g. music. Just to play some background music, you need to fiddle with your data, set up permissions, etc. Boring. Over the weekend I installed Steam. Obviously I run it under the gamer account. Not just because of performance, but also because my trust in Steam is far from being 100%. It downloads lots of external binaries and executes them. I trust Valve they are careful to not have any security incident (e.g. malware added to some of their game updates), they certainly have some security checks and policies, but how reliable are those? Does Steam executes everything inside some sandbox? I don’t know and honestly, running Steam (and dozens of third-party binaries it executes) in a separate account seems like a reasonable trade-off. When I tried to buy a game in Steam, I needed to log in to my Moneybookers account. But my financial passwords usually consists of 20 random characters and are safely stored in a password manager in the kparal session. I got very annoyed at this point. The string is too long to remember, I was offended by the idea to write it down (what do we have technology for if I need to use paper?) and I didn’t really want to save it in a plain text file on disk. Call it a whim. So how do I transfer it? Why on earth can’t I just run steam under the gamer account inside my kparal session and copy and paste it? Windows can do it! Well, it turns out Linux can do this too, more or less, but it needs a few tweaks. After that you can run any application under a different user account inside your desktop session. Let’s see how. ** (gcalctool:3969): WARNING **: Couldn't register with accessibility bus: Did not receive a reply. Possible causes include: the remote application did not send a reply, the message bus security policy blocked the reply, the reply timeout expired, or the network connection was broken. ** (gcalctool:3969): CRITICAL **: unable to create directory '/run/user/1000/dconf': Permission denied. dconf will not work properly. I haven’t yet seen any application where this would be required, so I can’t provide any more details. Basically if you see any errors regarding D-Bus, you can expect some loss of functionality. But often you might not care, it depends on what you need to achieve with that particular application. I like to use sudo instead of su, because it caches your password and it can be even configured for password-less login. However the approach is not so straightforward here and requires more tweaking. Only follow this section if su doesn’t suit your needs. I now used the command above to run Steam in my session and paste in the Moneybookers login credentials conveniently. Success! I quickly found out that sound is not routed for these redirected applications. It’s a pity it doesn’t work out of the box, but fortunately it can be fixed quite easily. First, install and run paprefs and activate Enable network access to local sound devices. I have no idea which configuration was adjusted, because nothing changed neither in ~/.pulse nor in /etc/pulse. But you can see now the pulseaudio server listening over TCP/IP for network connections. Authorization should be required, so you don’t need to be afraid of eavesdroppers. If you are lucky (unlike me), your audio now works out of the box. But if you pulseaudio daemon is restarted for any reason (it crashes or you kill it and start again), the routing no longer works and you need to re-log to your desktop session. Probably a bug. I didn’t know that, so I spent hours reading PulseAudio documentation. It’s not the most thrilling experience. You can copy ~kparal/.pulse-cookie to ~gamer/.pulse-cookie (and re-assign file ownership). That will handle authentication. Then you can forward audio by sudoing to gamer, exporting PULSE_SERVER=localhost variable and running the app you wish. libGL: Can't open configuration file /home/gamer/.drirc: No such file or directory. I tried to run chromium-bsu and extremetuxracer, both run around 30 FPS using software rendering. Not suitable to gaming at all. This can be added for example to /etc/rc.d/rc.local in order to be executed every boot. The other approach is to add gamer to the video group, which owns the file. In this case you don’t need to execute anything else on each boot, the change is permanent. The simple games I tried now run at full speed. Please note however, that there are slight security concerns when you elevate these permissions for gamer permanently. If the account gets hacked, the attacker can access your graphics card (maybe see your display? I don’t know) or even a camera (just if you used the video group approach, because this group also controls access to the webcam) while being logged in remotely. From this reason the first approach seems a bit safer to me (limits the number of devices) and you should definitely prohibit gamer from any remote access (e.g. disable this account in your ssh server configuration). That’s it, I can finally display graphical applications (even games) from a different user account inside my desktop session. It took me quite some time to find this all out. It’s highly probable that I did a lot of things the wrong way. Does anybody know of a tool that would handle all this setup transparently and easily? Or does anyone know a working sandbox tool that would fit these use cases? Please share your improvements in the comments. Thanks. 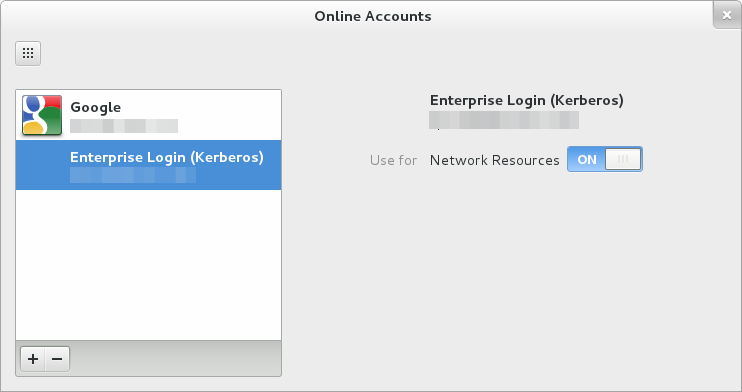 I have recently found out that GNOME Online Accounts now support Kerberos authentication. I assume this might be interesting for many people who use GNOME in an corporate environment, so I decided to spend a few words about it here. Every time you boot your computer now, you will also receive a Kerberos ticket. Awesome! Your computer has to boot inside the company network. If you connect to the network afterwards, you will not receive the Kerberos ticket. You can’t use the ON-OFF slider the force a ticket retrieval, because GNOME Online Accounts crashes. So back to kinit in this case. 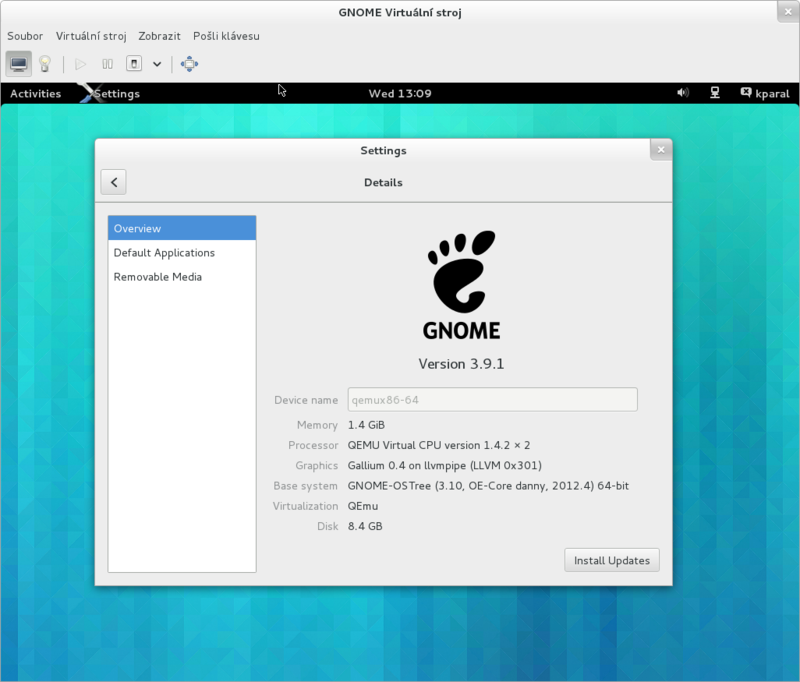 Let’s hope these problems will be ironed out in GNOME 3.8, currently it’s just a half-baked solution. But it’s definitely better than having nothing at all. For some reason the Totem’s auto-search function is now broken, so you have to do it manually. I suspect the reason is that the package names have changed (compared to Fedora 17 and earlier). Of course all of this only applies to citizens of those countries where software patents are not valid. Otherwise this action would probably be illegal and you might receive a capital punishment or similar. From Fedora 18, we will finally have LibreOffice included on Live CD, and installed by default! (We were able to do this by raising the Live CD size from 700 MiB to 1 GB, now targeting flash drives instead of CD media). This is great news for our users, because the office suite is needed by many and they had to manually install it in older releases. With this change Fedora 18 makes another step towards reasonable defaults, and it will certainly be appreciated by our newcomers. Thanks to everyone who supported me in the discussion, and Bill Nottingham for pushing that change. It’s a bit ironic that Fedora 18 DVD will not install LibreOffice by default, you have to select it as an “add-on” in the installer. The infrastructure standing behind package collections has been re-worked and it doesn’t allow us to enable some collection (like LibreOffice) by default. Of course you can still select it manually. Hopefully we will have it fixed and auto-selected in Fedora 19. I would like to warn you all about a serious bug discovered in Nautilus in Fedora 17 (GNOME 3.4). If you use it to copy files from your computer to an external HDD, you might experience a data loss (some files missing/corrupted). The problem is that Nautilus doesn’t show notifications properly when you want to eject the drive and all data is not written out yet. The bug has been fixed in Fedora 18 (GNOME 3.6), but it is still present in Fedora 17, and it is reported in bug 886435. It does not affect flash drives, only external HDDs (at least according to my tiny statistical data). However, none of these notifications are shown in Fedora 17, if you eject the drive using Nautilus. You then assume that everything is OK and disconnect the drive – and some of your data is silently lost. That works well and notifications are shown. If you happen to use some other desktop environment, like XFCE or MATE or something else with Nautilus, then probably the safest choice it to open up a terminal and run “sync” command. Once it finishes, all your data is written out correctly.